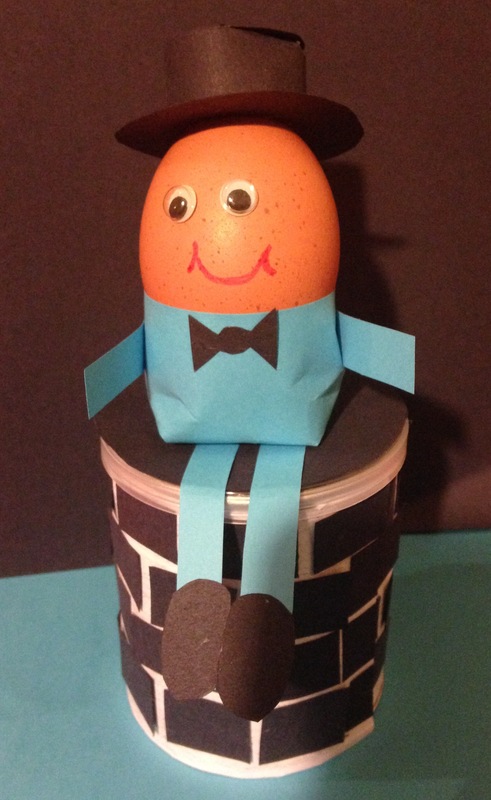 For Easter, the older pupils made little Humpty Dumpty Eggs sitting on individual walls. We made them from an egg and a mini Pringle box. First we blew our eggs, this was quite difficult. Then we made the “wall”, by sticking black rectangles on a shaded rectangular piece of white paper. We placed a black circle on the top of the box for the top of the wall. After that we made our body, leg, feet and arms out of coloured paper. We added a little dickey-bow for effect. The last thing we did was to make the top hat. Then we added googly eyes and drew on a mouth. They looked brilliant when they were all finished.